If you work only with basic word processing or text documents, then the Print dialog in Mac OS X is really simple: just tell it which pages to print, how many copies you want, and which printer to print from. Easy. And maybe also tell it to scale the pages to fit the paper. Still easy. But if you work with a complex desktop publishing application such as Adobe InDesign or QuarkXPress, there are dozens of choices based on what you've created, the kind of printer you're using, and the process that will be used to produce your final printed product. Adobe has done an admirable job of not only grouping the printing options into logical panels, but making those options context-sensitive. Thus, they change according to the printer you've chosen. So, if you choose a desktop inkjet printer, your options will be different than those available for a PostScript laser printer or imagesetter. 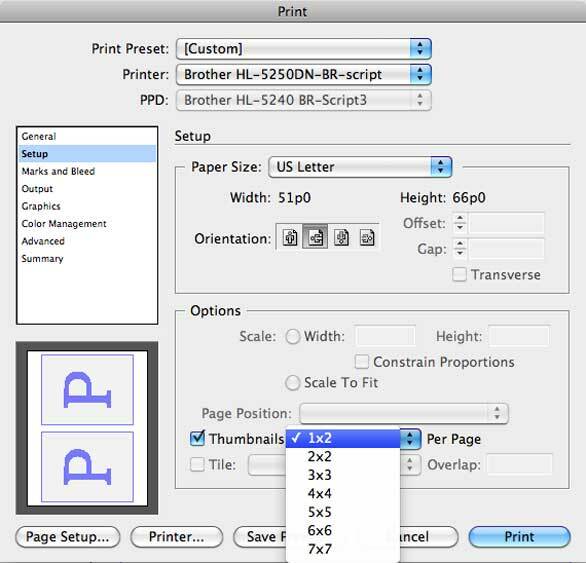 The General panel is fairly self-explanatory—you're telling InDesign which parts of your document you want to print. If your document is designed like a magazine, with left and right pages, the Pages section lets you print them side-by-side on the same sheet of paper—but you may need to scale the pages to fit on the paper. If you've used InDesign’s Master Pages to structure your document pages, you can print those pages from here as well. 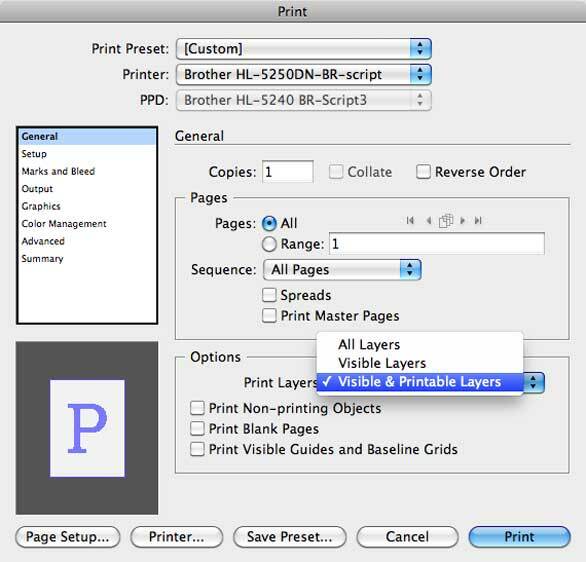 The Options section lets you override any object-specific or layer-specific printing or visibility settings you've made on the pages, and forces all the objects or layers to print. This also where you can force InDesign to print any blank pages in your document (normally InDesign saves paper by ignoring blank pages), and to print the page grids and guides you've used. Printing the guides can help a colleague understand a document’s page structure when you hand off a project to them. 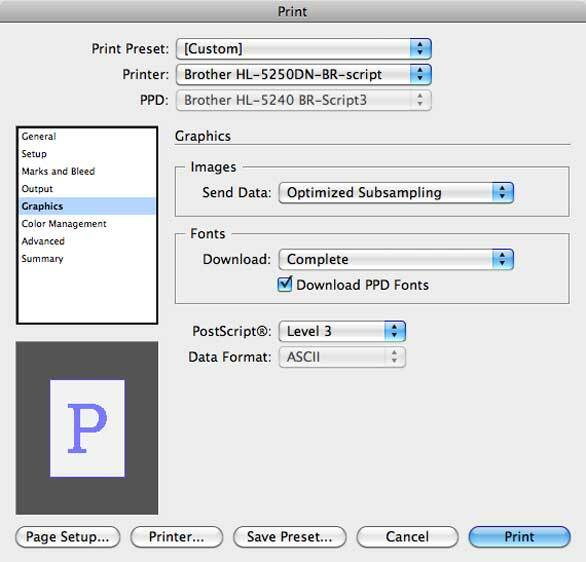 InDesign's Print dialog has eight separate panels to control output. The Setup panel is also pretty obvious—you can scale a page to fit the paper in your printer, control where a smaller page will print on the paper (centered is often helpful), print multiple tiny thumbnails of your pages on each sheet, or break up a larger page so that it prints on multiple smaller sheets that you can tape together (called tiling). The Preview window at the bottom left is tremendously helpful for seeing when you've made a terrible mistake, such as setting a vertical page to print horizontally. The Setup panel controls sizing and orientation. Here, we've told InDesign to shrink its pages to print two per sheet of paper. The Marks and Bleed panel is useful if you're going to be printing a smaller page onto larger paper and want to see where the page edges are, or if you want to quickly check that objects you intend to hang off the edge of the page (bleed) actually do. Some of the Printer's Marks are mainly useful for offset presses— you'll likely only want crop marks. The Marks and Bleed panel lets you add crop (trim) marks and print any objects that extend off the edge of the page. Note the helpful Preview window indicating that our choices are larger than our paper. 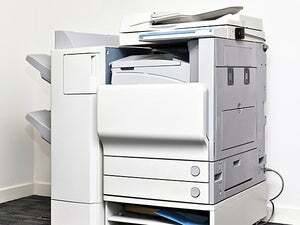 The Output panel is mostly used by printing professionals, but a couple of options are useful for mere mortals. If for some reason you want to print your color page in grayscale, use the Color popup menu. If you've used colored text but need it to print as black, use the Text as Black checkbox—useful when faxing a proof to a client. 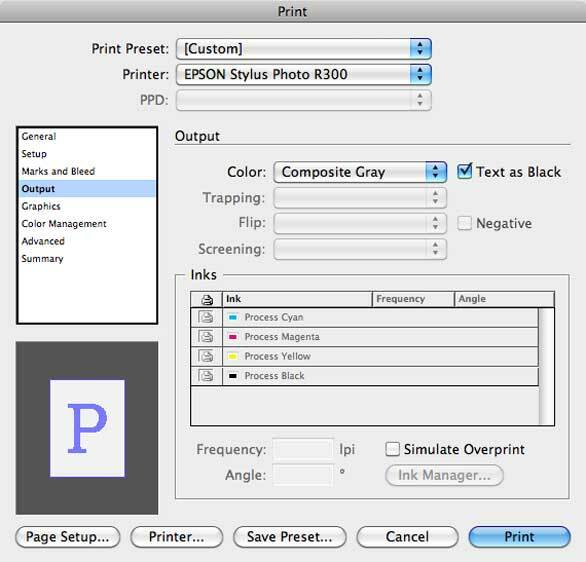 The Output panel can be useful to force colors to print as grayscale, or text to print as black. The Graphics panel should only be used by professionals for controlling the way image data is sent to an output device. The Images section has options to subsample each image to send only what's needed by your printer; to send just the on-screen preview to the printer (useful for quick proof prints when image quality isn’t important); to leave the picture boxes blank; or to send all data for all images to the printer. This sometimes gives you the highest quality print, but can take longer to process. The Fonts section lets you control whether InDesign sends the entire font for every font used in the document, or only the characters used in the document (Subset), or no fonts at all. If your fonts are already downloaded to your printer, or are located on a hard drive attached to your printer, you can choose None. The Graphics panel is for professionals only. 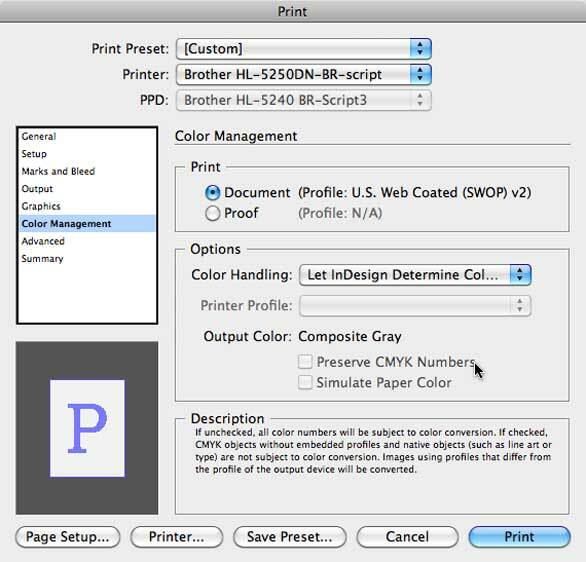 The Color Management panel also contains pro-level controls, but if you're working in a color-managed workflow, you can use your desktop printer to see an approximation of how your colors may appear on your final output device. Just click the Proof radio button. The Color Management panel is useful in color-managed workflows. The only thing to say about the Advanced panel is that if you don't know how to use it, stay away from it. Advanced is for graphics pros who typically work with prepress operations and have a deep knowledge of printing technologies. If that's not you (and, if you're reading this it probably isn't), then it's one less thing to worry about. The Advanced panel is normally used by output professionals to control how linked graphics files are handled, and for troubleshooting difficult files. 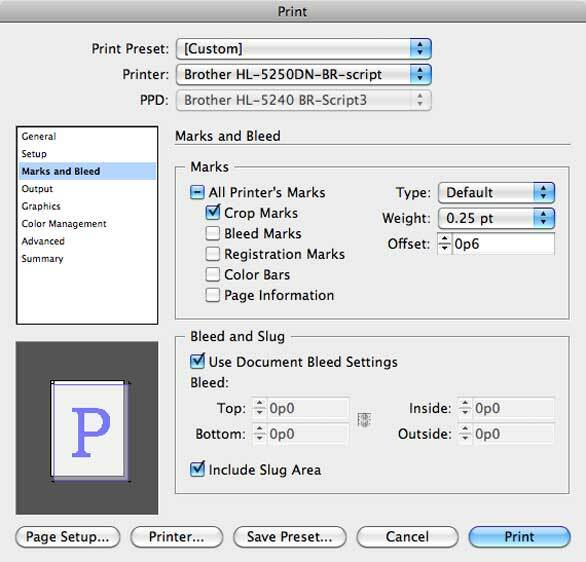 The Summary panel is, as the name implies, the total of all the settings you've used to set up the printing for a document. It lists all of your choices from all of the other panels in one place. The Summary panel displays all the choices you've made in the previous panels. The Page Setup… button at the bottom of the dialog window normally isn't used because its controls are duplicated in other areas of InDesign's Print dialog. But the Printer… button takes you to the familiar Mac OS X Print dialog that contains the options for your specific printer, such as paper handling, duplexing, media type, cover pages, scheduling, and color management in the printer. Don't be fooled by its buttons at the bottom for generating a PDF or to Preview your printed document—they won't do anything. 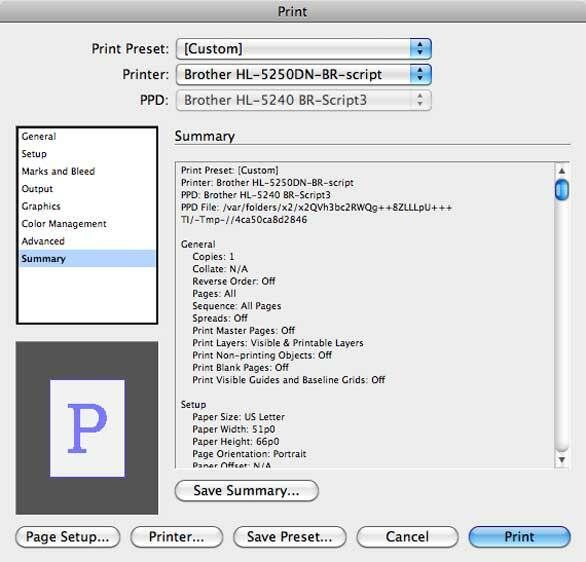 The Save Preset… button lets you save your chosen combination of options as a preset that you can choose from the Print dialog's top popup menu later on—so you don't have to go through all these choices again. You can manage your presets and export them to share with others by choosing File-> Print Presets. The various buttons at the bottom of InDesign's print dialog do a variety of tasks from taking you to the OS X print dialog to saving your settings as presets. All things considered, those are a lot of options! But your project will dictate which ones will be meaningful for you, and usually you won't be using too many of them simultaneously. Most people have only one or two printers, and you probably only print a few kinds of projects, so once you've found the combination of options that work for your projects, just save them as presets and you won't have to think about them again.